One of the reasons a lot of money is wasted on corporate training is that it’s nothing more than someone talking, in front of a set of PowerPoint slides. Not only do studies dhow, but experience from thousands of years show that to be good at something, you have to practice. But not just nay practice will do. It needs to be what psychologist Anders Erricson calls, deliberate practice. It’s easy to think that practice is simply doing a task over and over. This kind of practice is known as massed practice. It leads to good short-term memory. But that short term memory quickly fades. Remember cramming for school exams? 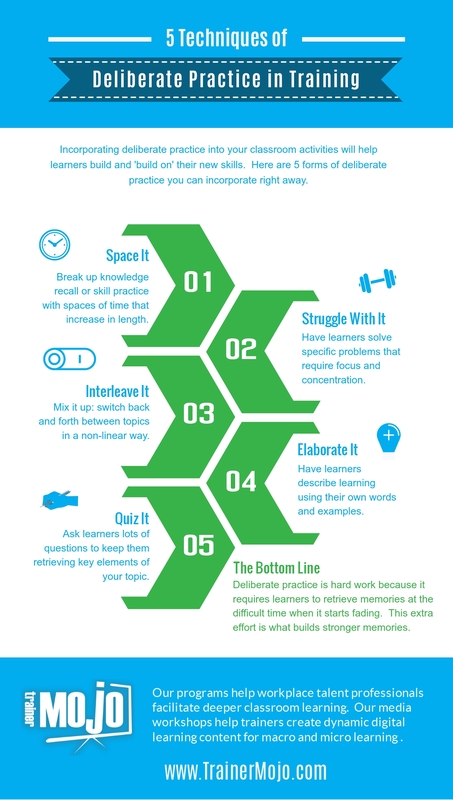 Deliberate practice, however, is purposeful and leads to better long-term memory formation. It involves retrieving memories just before they fade and is much harder than massed practice. Workplace learning is about building new knowledge and skills to help organizations work better. Skills and knowledge are simply memory models that we draw on to perform a task like log into a computer or drive a car. That’s why memory and the process of cognition are at the heart of what trainers do. A big problem in many corporate learning situations is that training is seen as an information dump. This happens in government, non-profit, and commercial organizations. A trainer takes participants through his set of PowerPoint slides. Or she explains a task then expects learners to go and apply it. In fact, the act of giving presentations often defines the trainer. In Jonathan Halls’ latest book, Confessions of a Corporate Trainer: An Insider Tells All, (due out in April 2019) he says that people often see trainers as if they’re mini keynote speakers. They see the trainer as someone who presents a speech to a small group of people. But in reality, the work of a transformative trainer is closer to that of a physical therapist. Just as a physical therapist gets patients stretching their muscles during and after an office visit, effective trainers get learners firing their neurons and processing memories during and after the class. In the form of deliberate practice. Simply presenting information well or in an entertaining way does not necessarily lead to learning. In fact in our experience it more often fails to lead to learning. But deliberate practice does lead to learning. Learning happens when the learner fires neurons and processes information in the form of new and old memories. Deliberate practice, is about firing those neurons in a purposeful way before the memory fades so those memories are guaranteed to stick. Master trainers create learning situations where learners engage in deliberate practice.